The photo opportunity the world was waiting to see the two leaders clasping hands has also been a goal of the Kim dynasty for decades. At times, Trump seemed to be falling over himself to shower the younger man with compliments. 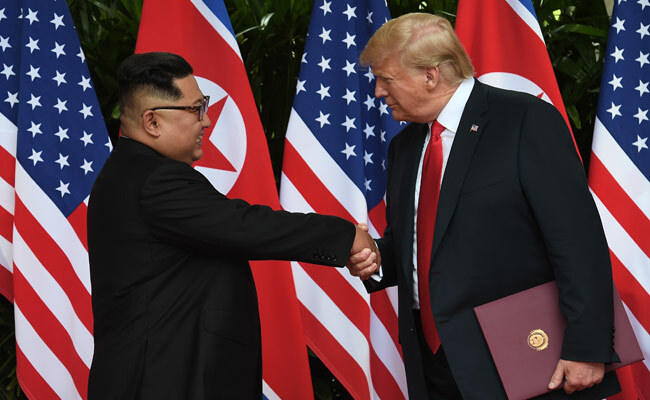 A historic handshake in front of US and North Korean flags, a solemn signing ceremony and back-slapping compliments: critics charge that US President Donald Trump has legitimised Kim Jong Un on the world stage. The photo opportunity the world was waiting to see -- the two leaders clasping hands -- has also been a goal of the Kim dynasty for decades. And analysts noted that Trump was treating as an equal a man who only a few months ago seemed to be tipping the world towards nuclear war and whose regime has been accused of horrendous human rights abuses. It was not necessarily an "unbearable cost", he tweeted, but added: "The legitimising effect on North Korea's regime is undeniable." Only months ago, Kim and Trump were hurling personal insults at each other -- "dotard", "rocket man" -- and boasting about their nuclear buttons. But in the luxurious surrounds of a hotel in neutral Singapore, the pair appeared almost playful at times, going for a stroll in the grounds and Trump allowing Kim a peak inside "The Beast", his armoured car. "I learned that he's a very talented man. I also learned that he loves his country very much," said Trump, adding that Kim had a "great personality" and was "very smart." The contrast with the G7 meeting only days earlier, where Trump found himself isolated over trade policy among traditional allies, was stark. "Something important happened here that can never be taken back," said Adam Mount, a nuclear policy expert at the Federation of American Scientists. Amid the cynicism, supporters of the talks process argued that Kim's acceptance on the world stage had positive aspects, and was better than leaving him an isolated threat to world peace. And so soon after North Korea frazzled global nerves with nuclear and missile tests, many commentators said that talks and an agreement, however weak, were clearly better than the two sides lobbing insults -- or worse. "We are beginning to think about North Korea and Kim Jong Un in terms of 'opportunity', rather than threat, and that itself is a historic transformation," said John Delury, a professor at the Seoul-based Yonsei University, who has long backed engagement with Pyongyang. "What this does is encourages KJU in his readiness to come out into the world for dialogue and making peace." On his fifth outing on the world stage, Kim continued his efforts to soften his image, going for an extraordinary night-time stroll to view Singapore's sights and even providing the world with the first-ever Kim selfie. In North Korea, the state-run Rodong Sinmun newspaper printed no fewer than 14 images on its front page of his visit to the Marina Bay Sands hotel complex and other sights. Kim also earned himself headlines around the world, and arms control specialist Jeffrey Lewis tweeted: "I maybe got a little annoyed at the enthusiastic coverage of what is, at its base, a reality television episode."